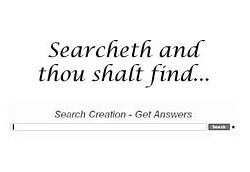 “That which is far off, and exceeding deep, who can find it out? Questions! Everybody seems to have a question that they need answered in life. Hi! My name is Eric. In this next seminar, Dr. Hovind takes a large variety of questions that he's been asked on a regular basis, combines them, and gives his best explanation for what's happening. He covers a variety of topics, such as; The Red Sea crossing, primitive man, What about radiocarbon dating? Hey, Are there really contradictions in the Bible? Find out for yourself in this creation seminar entitled: Questions and Answers. - How to establish truth? - The birth of a star, has it been observed? - How many stars are there? - How to tell the distance to the stars? - Did ancient man have brass and iron? - Did the Egyptians have electricity? - Was ancient man medically advanced? - Is the environmental movement a front to abolish private property? - Evidence for global warming? - A cruel ór a merciful God? - Contradiction: 10 cubits across, is not 30 cubits around...? - Contradiction: 2,000 or 3,000 baths...? - Contradiction: 40,000 or 4,000 stalls of horses...? - Contradiction: 700 or 7,000 men...? - Contradiction: ‘Languages divided up’ or ‘of one language’...? - Contradiction: 24,000 or 23,000...? - Contradiction: Easter or Passover...? - Contradiction: Suicide or slain...? - Contradiction: Whale or fish...? - Contradiction: 4, 6 or 8 legs...? - ‘Preserve His words’ or ‘Keep us from such people’...? - Creation according to King James (1): ‘from the beginning’ or ‘ages past’...? - Creation according to King James (2): ‘the first day’ or ‘one day’...? - Did any of the early trendsetters of evolution have scientific degrees? Thank you for joining us. 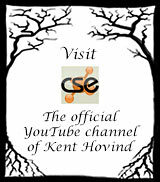 My name is Kent Hovind. I taught high school science for 15 years, and this is going to be seminar part 7, Question & Answer Time. If you've gotten this far, hopefully you've seen the first 6 seminars. Because we'll be covering new information this time. I taught science 15 years, and I cover information on the subject of creation, evolution, and dinosaurs. I take the position that the Bible is literally true, scientifically accurate in all details. And the evolution theory being taught in our schools is the dumbest and most dangerous religion in the history of planet Earth. We're going to be covering a wide variety of questions that I get during my Q & A time. Everywhere I go, I try to teach for an hour or so, then have a question and answer time. I have heard most of the questions that generally come up in the last 17 years that I have been doing this. How do we see stars billions of light years away? Have there any fresh dinosaur bones been found, not even fossilized yet? Why are there so few human bones found? What about the Bible codes? What about other religions; could they be right? A whole bunch of stuff we're going to be covering as quickly as we can. There is much more information about all of these topics on our College Class. We talk College Classes CSE, the 100-series, 101, 102, 103 & 104, you can take those and where we have time we go into a lot more detail. And then the 200-series is even more depth then that, ok. So you can..., if you don't get enough information or if I don't answer one of your questions you can call in to our daily radio program. Every day 4:30 to 6:00 currently, we may change the time some day, but currently 4:30 to 6:00 central time, monday to friday, when I am not traveling. I am live on the Internet, drdino.com or truthradio.com and you can do..., take our College Classes and ask questions there, we cover just a whole lot more material. All of the slides that I use in my seminars, it is close to 7,000 now, are available to download off my website, drdino.com. Or you can just order the DVD's or CD's of all of the slides. A lot of slides, you see, they have a little asterisk, next to, near the end, that indicates there is something in the notes section of the slide. And there is a lot of things I have to skip just for sake of time, but hopefully we are going to answer some questions for you here. So first, it's not true that all scientists believe in evolution. Secondly, even if they did, that's not how you establish truth. It doesn't matter what the majority believe. 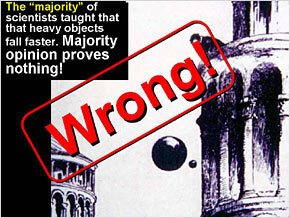 The majority has a long history of being wrong. They used to teach that all the planets go around the Earth. The majority was wrong. Though, believe it or not, there still are some scientists who are geo-centrists, who teach the Earth is in the center and that everything goes around the earth. I've got the books in the library. You can read those, if you want to. I've looked at the subject; I just can't buy it. I think they're wrong; I think the Sun is in the center. There was a time when they used to teach that big rocks fall faster than little rocks. It was taught for 2,000 years, and it's wrong. So the majority can be wrong. They used to teach the doctrine of humors. If you're sick, you have bad blood. Take out your blood and you get better. That's how George Washington died. They were wrong, and in that case, they were dead wrong. In John 7 (v. 40-42): “Many of the people therefore, when they heard this, said, of a truth this is the Prophet. Others said, This is the Christ. But some said, Shall Christ come out of Galilee? Hath not the scripture said, That Christ cometh of the seed of David, and out of the town of Bethlehem?” Notice what happened here in John, chapter 7. The people were arguing about “Was Jesus really the Christ?” Some of them said: “Christ doesn't come out of Galilee, but Jesus came from Galilee.” The problem is, they had a misconception. They thought Jesus came from Galilee. Where was Jesus actually born? Bethlehem. So they had the whole wrong problem. They are arguing about the wrong subject. John 7:43 says: “So there was a division among the people because of him. And some of them would have taken him.” They would have tried to kill the messenger. Because they had a wrong impression, they thought: “This Jesus is out there preaching, and we've got to shut him up.” They got the wrong impression to start with. And that is what happens, people get the wrong idea. They think that Creationists like me are doing damage to the education system. No, we're the right people. We're trying to fix the problem. We are trying to resolve it. Continuing, John 7:45-46 says: “Then came the officers to the chief priests and Pharisees; and they said unto them, Why have ye not brought him?” Now this is classic, notice the chief priests sent their hoodlums to go get Jesus. Jesus answered their questions. They came back and said: “Wow, never a man spake like this man.” And then the Pharisees said: “Well, you should have asked him this.” I get this every time, including 3 days ago, in Michigan at the University up there. There is always some professor that says, you know, they advertise that Hovind is coming to the university to speak, the Northern Michigan University. Ot the week before I was in Wisconsin, Milwaukee Wisconsin. A 100 or so professors in Milwaukee refused to debate me. 80 professors in Northern Michigan University refused to debate me. I've had close now to 4,000 professors that have refused to debate me on the subject. And they don't even come when I speak. Professors send their students, and tell them: “Here, ask him this; ask him this; ask him this.” The student comes back and says: “Teacher, he answered all my questions.” And then the teacher says: “You idiot, you should have asked him this and this and this.” Well, teacher, you coward, why didn't you come? Why didn't you ask the questions? Professors today do just like the Pharisees did. The professors send their students to try to trap the Creationists. They won't come themselves, and then when that doesn't work, they try to use the law to silence them. Let's just pass a law that says you can't teach creation science. Or if anybody does try to teach Creation, we're going to get them fired. Send them out of here. 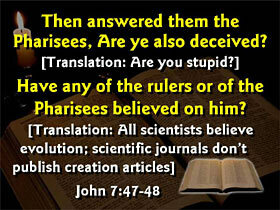 Continuing, John 7:47-48: “Then answered them the Pharisees, Are ye also deceived?” (Hovind translation) “Are you stupid? Has this guy deceived you too?” Then this is the classic one they always use: “Have any of the rulers or of the Pharisees believed on him?” Translation: “None of the other scientists believe this creation stuff; therefore, evolution must be true.” Now think about that logic; the majority believes this, therefore it's true. I mean, that's silly! In the first place it's not true that the majority believes this. Secondly, that's not how you tell. 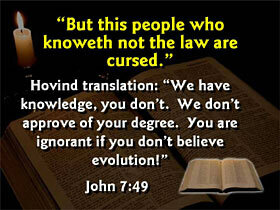 And then they said: “But this people who knoweth not the law are cursed.” Hovind translation: “We have knowledge; you don't. We have a degree; you don't. We don't approve of your degree; it's from a non-accredited Christian school. Therefore, we're smart; you're dumb.” That's a common tactic used by professors today including the 99 professors I've debated. It happens all the time. But Nicodemus wisely said, (John 7:50-53) “Doth our law judge any man, before a hearing?” Nicodemus at least had the common sense to say: “Hey, before we judge this guy, Jesus, and say he's wrong, he's stupid; let's listen to what He's saying.” And I would encourage college students and professors and anybody, listen to the Creation side. Just listen. Really honestly listen and hear it, and then make your decision. When I spoke in Soviet Union a couple of years ago, at a university in Ukraine, they shut down the university and sent 30 professors to hear me speak for 2 hours on creation. I was a big celebrity, you know. Dr. Hovind, all the way from Florida. The further away I travel, the more famous I am. Anyway, they shut down the university, and even 30 professors came. After about an hour of speaking on creation, one of the professors was crying. I asked the translator, Olga: “What's he crying about?” She said: “He's never heard the creation story. He didn't know there was one.” And I think there are a lot of people in America, a lot of students that I see in America, who have never really, honestly heard the creation story. So, if somebody says everybody believes in evolution, therefore you should too, number one, that's not a good argument and it's not true. And just listen to the creation side; understand it. Last week I sat by someone on the airplane who believed in evolution. I said: “Well, let me just explain the creation side.” I took 3 minutes and explained the creation view very simply. 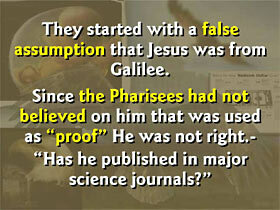 And he said: “Wow, that makes a lot of sense.” Ok, they started with the false assumption; that Jesus was from Galilee. He wasn't. He was actually born in Bethlehem. Some of the Pharisees had not believed in Him, so therefore, that's “proof” that he's not right. You get the same thing today. Some scientists don't believe in creation therefore, Creation is not true. That is absolutely stupid logic. And they'll say: “Has he published in science journals?” As if, well, you don't see creation articles in National Geographic. Therefore, that proves it's not right. Well, you didn't see many capitalist articles in communist journals, 10 years ago either, by the way. It doesn't prove anything is right or wrong. 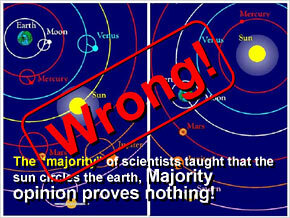 The majority can be wrong. The majority followed Aaron into rebellion (Exodus 32). The majority voted not to go into the Promised Land (Numbers 32). The majority followed false gods many times in the Old Testament. The majority of the leaders hated Jesus. The majority of the world hates Christians. The majority voted in Bill Clinton twice, for heaven's sake. I mean, the majority can be wrong, right. They can be dead wrong. But it's not true that all scientists believe in creation. 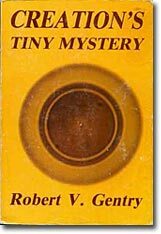 There is a book here by Dr. Robert Gentry, a good friend of mine from Tennessee. He's a very famous scientist who did work on the disposal of radioactive waste. What do you do with this product, nuclear waste? He has done advanced research on the granites from around the world. He discovered that as you look at granites under a microscope, you find that they've got little tiny halos in them, radio-palonium halos. We'll get into more of that later. Robert Gentry was a very famous published scientist until they found out that his research was proving evolution is not true. Because he really proves the earth was never a hot molten mass. He never mentioned creation or God. It was purely scientific research. They published him in all the major journals, until somebody said: “Wow guys, Dr. Gentry's work is proving the Big Bang Theory wrong.” They took away his funding and shut off him off like a spigot. They persecuted somebody just because his work was not supporting the sacred cow of evolution. 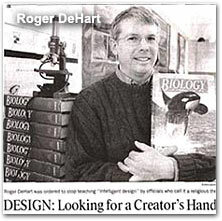 Roger DeHart was a science teacher at Burlington-Edison High School near Seattle. One day they told him that he could no longer tell his students about errors in the textbooks. All he was doing was comparing the textbooks to current science journals. For instance, their textbook said the baby has gill slits like we covered in my Seminar #4. DeHart would bring in a science journal and say: “Guys, I'm sorry but it says in the textbook on this page that the baby has gills. That's not true. Here's a current science journal. ”He showed them the evidence. He never mentioned God. He never mentioned the Bible. He never mentioned creation. He just said this textbook's not accurate. And they told him he couldn't do that. You can't inform your students that the book is out of date? That's the kind of persecution that anybody gets, when they try to go against this evolution theory. Evolution is a carefully protected state religion. Just like communism was a carefully protected state religion if you grew up over there. You don't dare question it. Kevin Haley was a biology teacher in Oregon. He lost his job simply for exposing errors in the textbooks. He told them: “This book's not right. There's a mistake here.” They said: “You're fired!” You can't teach here if you there say there are errors in our books. Baylor University in Waco, Texas fired William Dembski in April 2000, simply because he told his students there might be an intelligent designer. They said: “Oh, you're not allowed to say that. So they fired him.” This is Baylor that used to be a Christian college. 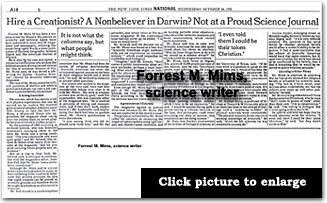 Forrest Mims was a science writer for years. He wrote for many major journals; National Geographic, Science Digest, and American Physics. He wrote all kinds of articles for magazines. But when he applied for a job at Scientific American, he was denied it. They said: “You can't work here, because you are a creationist.” Even though what he was writing on had nothing to do with the subject of creation or evolution, they told him: “We don't want you on our staff, because it would look bad if we hired a creationist.” That's the type of persecution you get. 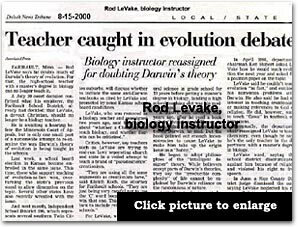 Rod LeVake told his students: “I kind of doubt that this Darwin theory is true.” So they took him away from teaching biology and gave him another job. They said: “We don't want you teaching biology, because you might make our students doubt Darwin's theory.” That's how it's protected. It's a religion. 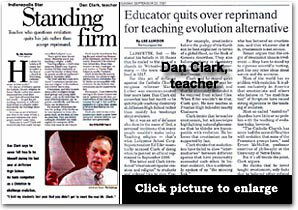 There was a teacher in Indiana by the name of Dan Clark. His superintendent, Ed Eller, called him in and said he couldn't introduce creation to his class. Now there's no law against teaching creation at all. There are no court cases saying you can't teach creation. Courts have only ruled that it can't be mandatory. Teachers have the right to teach creation. Here's the problem. The law says you can teach it. The courts say you can teach it. But your boss now says you can't. So he quit his job finally over that. He stood firm. He said: “Look, I'm not going to bow to this one.” He quit his job. 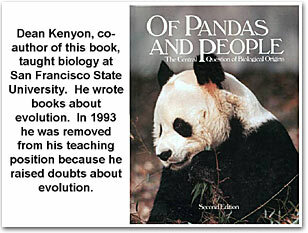 Dean Kenyon wrote the book, Of Pandas and People. He was a science teacher at San Francisco State University. He wrote this biology textbook that says: “Hey, there must be some kind of designer. This is so complicated. This is amazing. There must have been a designer.” It doesn't try to get them saved; to be converted; to get them to be a Baptist or a Buddhist or a Catholic. It just says: “ Look, there must be a designer.” He was a tenured biology professor at San Francisco State University.He had written all kinds of books about evolution in the past when he had believed in it. Then he got converted and said: “You know, I really doubt that this theory is true. It doesn't work.” And so they fired him. But he was tenured, so he sued them and got his job back. They put him in as a lab assistant washing test tubes, stuff that the students do. He had to sue them again to get his real job back. Just because he said: “I think there might be a Creator to this universe.” That's the type of persecution you get. I spoke in Lubock, Texas, where they told me about a professor named Dini who teaches biology. He told his students: “If you don't believe in evolution, don't ask me for a recommendation to go off to medical school, because I won't give you one.” This was on his website for years. “If you don't believe in evolution, you'll never get a recommendation from me.” Well, when I went to speak there in Lubock, Texas, the students offered Dr. Dini $1,000 dollars to debate me for 2 hours. And he refused. A thousand bucks for two hours? That's pretty good money. How would you like to make a thousand bucks for two hours? He said: “No.” He wouldn't do it. The persecution that happens against Christians and against Creationists in the secular school system is mind-boggling. What are they afraid of? So I say, it is not true that all scientists believe in creation. But many scientists that do believe in creation are afraid to say anything, because they know the kind of persecution they're going to get. How many teachers were there in Ukraine that did not believe in communism, but didn't dare say anything about it? Anybody that didn't even smile right at Stalin, he'd kill ya. You'd end up in the Siberian gulag or someplace. That's the kind of thing that now happens in America, believe it or not. If a person doesn't support the evolution theory vocally and actively, They will be banished to ‘academic Siberia’. They will lose their grant money. They will lose their job. Sad. Patrick Henry College was told back in November of 2003, I believe, that they weren't going to get accreditation, because they didn't teach enough evolution in their college. There's an article in the Agape Press here, with one such story. “A university professor says that she was asked to resign for introducing elite students to flaws in Darwinian thought at the Mississippi University for Women.” I spoke just north of there a few weeks after this happened. I spoke to some of the people involved. This lady was told she had to resign her job, because her teaching might make students doubt Darwinism. What are they going to school for; education or indoctrination? You are going to get an education, I thought. And it used to be that way, but not anymore. It's pretty sad. And this lady said that the professor who wanted to fire her hadn't even heard her speech. But she was raising doubts about Darwinism. All kinds of scientists, thousands of them, down through history were creationists. All the branches of science were started by creationists. Just go to www.answersingenesis.org website and type in: ‘scientists who believe creation’. It will bring up all kinds of articles, and you can read about all these scientists through history who have been creationists. Very famous scientists. I have often asked evolutionists: “Can you name me one advancement in modern science we have because of the evolution theory?” Is that why we have computers? Is that why we have telephones? Radio's? Is that why we went to the moon? What advancements can be named that came about because of this evolution theory? They've never given me an answer. There is nothing. The theory is useless. But all major sciences, every branch of science in the last 400 years, was started by creationists. Now they weren't all young earth creationists like me, and they certainly weren't independent, temperamental, fundamental right wing radical Baptists like me. But they were, you know, all creationists. Wernher von Braun, the former head of our space program, was a creationist. A.E. 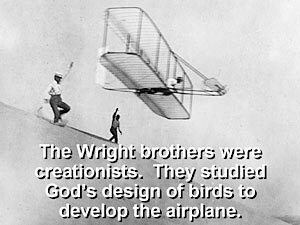 Wildersmith, William Ramsey, the Wright brothers. They studied birds. They said: “We wanted to see how the designer, the Creator, how God, made the birds and then we'd learn how to make an airplane.” The man who invented the MRI, magnetic resonance imaging machine, is a young earth creationist. There are creationists today. There are a couple of good books in our library or for sale on our website. 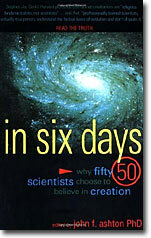 In Six Days by Ashton is one book, and On the Seventh Day is another book. This one shows 50 scientists who believe in creation. 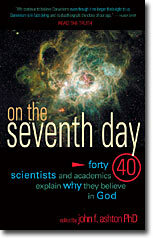 Here are 40 more scientists who believe in creation. You can get these. There are thousands of scientists who do believe in creation. They do not believe in evolution. Karl Popper, a famous leading philosopher of science said: “Evolution is not a fact. Evolution doesn't even qualify as a theory or as a hypothesis. It is a metaphysical research program, and it is not really testable science.” Evolution is a religion, and they get so angry when I tell them that. Which is probably why I tell them that every few minutes, because I enjoy pushing the right buttons. Julian Huxley, whose grandfather, Thomas Huxley, was the one who really pushed Darwin when Darwin's book came out, said: “I suppose the reason why we leapt at the Origin of Species was that the idea of God interfered with our sexual morés.” We don't want God telling us what to do. That's why they accepted evolution. Michael Ruse said: “Evolution is promoted by its practitioners as more than a mere science. Evolution is promulgated as an ideology; a secular religion. It is a full-fledged alternative to Christianity, with meaning and morality.” He said: “I am an ardent evolutionist and an ex-Christian, but I must admit that in this one complaint. And Dr. Duane Gish (of ICR) is but one of many to make it. The Biblical literalists are right. Evolution is a religion. This was true of evolution in the beginning, and it is true of evolution still today.” Evolution is a religion in every sense of the word. “Evolution is a fairy tale for grownups. The theory has helped nothing in the progress of science. It is useless.” So it's not true they all believe it. Nearly all branches of science were started by creationists. Evolution has added nothing to science. When students or professors fear expressing their real, honest thoughts, the students are not getting educated, they're getting indoctrinated. Students get flunked for not supporting the evolution theory. Every week when I go out and speak, someone will come to me and say: “When I was in biology class, I wrote a paper and the teacher gave me an F, because it didn't support evolution, or because I dared to go against the evolution theory.” I get calls like that. Diane, you take some of the calls and transfer them over to me. Students say: “What do I do? My teacher gave me an F, because my paper went against evolution.” It's sad. I mean, it's discrimination. All the advancements in modern technology have nothing to do with evolution. Evolution is a hindrance to science, not a help at all. Ok, next question. What about separation of church and state? First of all, there's no such phrase in the US Constitution. You can get the entire Constitution, the Bill of Rights, and the Declaration of Independence for $1.00 in the Citizen's Rule Book. Everybody ought to read this one. It's got a great story in it about jurors. It is amazing the power that jurors have. One juror can decide that he doesn't like the law. If they pass a law in your city that you can't spit on the sidewalk, and somebody does it and they videotape it. They've got the whole thing on tape. He broke the law. They take him to court. It's proven; he broke the law. But you as a juror say: “I don't like that law. I don't think it's fair to say, ‘You can't spit on the sidewalk.’” The judge is going to threaten all the jurors: “You have to rule according to the law. You have to listen to my instructions.” You don't have to listen to anything that judge says. He's blowing smoke. Smile, nod your head, and when you get in that room, vote ‘not guilty’. The rest of the jurors are going to think you're nuts. They'll say: “What do you mean not guilty? You saw the tape, you saw!” - “Yes, I know, but the law's no good.” Jury nullification is a powerful, powerful story in here. The Constitution does not mention separation of church and state. You should get the Federalist Papers. Those were all the papers the Founding Fathers wrote as they were developing the new US Constitution. And you can see their thinking processes. The same day that they voted for the First Amendment, —you know, which people often think says separation of church from state, which is not what it says. It says the government shall make not make a religion or prohibit the free exercise thereof.— But that same day, congress voted to send $25,000 to help a Catholic missionary start a mission to help the Indians in Saint Louis. They were not trying to separate church and state. They wanted to keep the state out of the church but not keep the church out of the government. There is no phrase in the US Constitution about separation of church and state. And it's perfectly legal for Christian teachers to do all kinds of Christian things in their school. My brother taught 34 years in a public school. He had a picture of Jesus right by his desk all 34 years. Many teachers keep a Bible right on their desk. Now if they give you a hard time; the principal might say you can't do that. I'm not saying you won't get persecution. But as far as legally, it is. If you have trouble, you can contact www.lc.org, libertycounsel.org, Matt Staver's organization. He handles cases like that. David Gibbs’, they do stuff like that, it's an organization in Orlando, Florida. So yes, if you have trouble, see one of those folks. But what happened is that Thomas Jefferson wrote a letter to some Baptist pastors, and he's the one who mentioned the phrase, in the letter, “separation of church and state”. Now the atheists are using it to say you can't have Christian things in government. What a dumb idea! Our country was founded to be a Christian country. They all said that. Go to www.wallbuilders.com, David Barton's great website. He's got lots of stuff. There's no such thing as separation of church and state, so don't fall for that. And we cover more on that in our College Class. Here's what's happened though. The Constitution of the United States, Article One, Section 10 says: “You have the right to make a contract.” Let's suppose Adam says: “Brother Hovind, I'm going to pay you $10.00 an hour for the rest of my life.” Ok, ...and he signs a contract. And then he does not fulfil the contract. Well, then I can sue him. And he could say: “Well, I've got a constitutional right to keep my money.” Yes you do, but you also have a constitutional right to make a contract. And you made a contract. So, the judge is just going to uphold contract law. Now, what churches do is they sign a contract, and they don't even know they are signing it. They sign up to become a 501(c)(3). As soon as you become 501(c)(3), you are now a corporation, you are not a church. See, God creates people and God established the church. People created government. And government creates corporations. So, a church that becomes 501(c)(3), has stepped way down from where God intended him to be, and they have now become a creature of the state. If you read Internal Revenue code 508 which is where 501(c)(3) comes from, go turn over a few pages to 508. Internal Revenue code 508 section (c)(1)(a) says: “Churches are mandatory exceptions.” Not an exemption, they're an exception. The government recognizes churches do not have to get 501(c)(3) status. But if they do, they've just put a noose around their neck. Say, hang me whenever you like. They can't talk about politics, you can read 501(c)(3). They can't get involved in political campaigns. So, separation of church and state? I would say, well, if you are 501(c)(3), probably correct. If you are a real church ministry? No, no problem. The birth of a star, has it been observed? How to tell the distance to the stars? Ok, a question I very frequently get asked, I would say every single week I go speak, which is 52 weeks now a year for 16 years. Every single week somebody will say: “Now Hovind, how do we see stars billions of light years away? You say the earth is only 6,000 years old. How do we see the stars?” Yesterday on the radio program on the website www.drdino.com, somebody called in and said: “Now Hovind, I did some studies and in a 6,000 year light year radius, we'd only have so many cubic miles and all the stars wouldn't fit.” I said: “Wait, who said anything about a 6,000 light year radius?” He said: “Well, you're the one who said the earth is only 6,000 years old.” Yes, I did, but I never said all the stars are in a 6,000 light year radius. That would be ludicrous. But, how do we see the stars billions of light years away if the universe is only six thousand years old? And I believe the Bible clearly teaches it's only 6,000 years old. And God made everything. 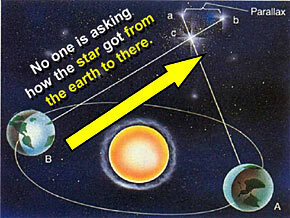 Actually, He made the Earth first (Genesis 1), and then (v. 14), He made the stars also. Evolution says the stars evolved first, and then the Earth. Well, there certainly are a lot of stars out there. Nehemiah 9:6 says: “Thou, even Thou, art Lord alone; Thou has made heaven, the heaven of heavens.” God is claiming that He made them. So either He did or He didn't. Well, what about the stars? How do they fit in? Astronomers can see a star blow up about every 30 years. It's not like it's on a time table. It might happen again after 5 years or then in 50 years, but on an average, a star explodes once every 30 years. And they're looking out there with their telescopes, “Oh wow, there's a new one.” A star exploded. 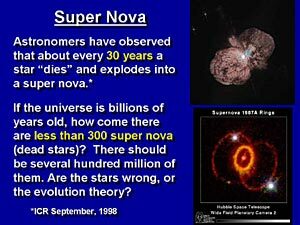 It's called a ‘nova’; or if it's a big one, they call it a ‘super nova’. No-va in Spanish means, no go, and by the way, the Chevy Nova did not sell very well in Mexico, for that reason. Hé, do you wanna buy a Nova? No, why would I do that? It won't go. Stars blow up every 30 years. 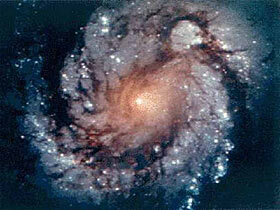 Well, they've searched the heavens with their telescopes, looking for how many super nova rings are there. They call it a dead star. They can find less than 300. Now wait a minute, if there are less than 300 super nova rings. And one happens every 30 years; you can do the math. I mean, that's about 9,000 years. If the universe is billions of years old, there ought to be a whole lot more super nova rings out there. Why are there less than 300 super nova rings? Ah, because it is less than 10,000 years old? Boy, they don't like that answer, at all. But that's the logical conclusion. Anyway, if stars are blowing up every 30 years, we would have to have at least one star born every 30 years just to keep the balance. Countries that have a population problem because they are getting less births than deaths, like Germany. More people are dying than being born. Oh well, eventually that is going to create a problem, ok. Stars should have to be born. Nobody has ever seen a star form, not one. We see them blow up all the time, but they've never seen a star form. And I'll cover that in a second. The latest estimate by the Hubble telescope was that there are 70 sextillion stars, 70.000.000.000.000.000.000.000. They say the universe is 20 billion years old. Well, you can do the math. 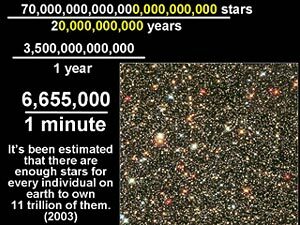 That means 6½ million stars would have to form every minute. We'd have to have 6½ million stars forming every minute for 20 billion years to make the stars that we know about. That doesn't count the one's we don't know about, because we can't see them yet. Who knows how many stars there are out there? Sometimes the textbooks will say: “Well, there are new stars being constantly born in clouds of gas and dust.” This is so stupid. How a physics textbook can teach this, I don't know! Anybody that knows freshman physics knows that when you try to squeeze gases together, pressure builds up, temperature builds up, and it drives them back apart. It's called Boyles’ Gas Law. Nobody has ever seen dust collapsing into a solid. It would take such incredible pressure to do that. I was in a debate one time, and I said: “How do you get dust to collapse into a solid? Explain that to me.” He said: “Well, we calculated that if 20 stars explode near each other, it will produce enough pressure to make a brand new star.” I said: “Now that's brilliant! You've got to lose 20 to gain one.You ought to run for Congress. You could help those guys borrow their way out of debt.” It's not going to get a universe full of stars if you've got to lose 20, to gain 1. And even that is theoretical. It's never been observed, ok. I was at Alamogordo, New Mexico. 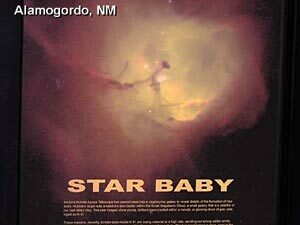 They have a science center down there, and they showed these pictures of ‘star babies’. They said this is a new star forming. No sir, it's a bright spot. One guy in Science Magazine admitted: “The silent embarrassment of modern astrophysics is we do not know how even a single one of these stars managed to form.” Nobody knows how stars can form from dust clouds. “No one has unambiguously observed material falling into an embryonic star, which should be happening if the star is truly still forming. And no one has caught a molecular cloud in the act of collapsing.” “Precisely how a section of an interstellar cloud collapses gravitationally into a star; a double or multiple star, or a solar system; is still a challenging theoretical problem. 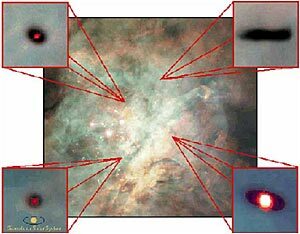 ...Astronomers have yet to find an interstellar cloud in the actual process of collapse.” “The Origin of stars represents one of the most fundamental unsolved problems of contemporary astrophysics.” This guy says: “No one really understands how star formation proceeds. It's really remarkable.” Nobody knows how this happens. So if they tell you new stars are forming, you tell them Kent Hovind says they're confused or they're lying, because nobody knows how it happens. There's not even a good theory about how you could squeeze dust into a star and there's certainly no evidence. Here's what happens. They see bright spots appear in the dust clouds in space. They look at this Crab Nebulae or Eagle Nebulae. And they're staring at it, and all of a sudden one day the spot gets a little brighter. Oh wow, a star is being born. that is immediate their conclusion that a star is being born. Wait, wait, wait, maybe the dust in front of it is clearing, and the star was already there. Maybe it's a star blowing up. Maybe it's another super nova. Because that's what happens, these super nova's get really bright. They don't know that a star is forming. So, don't let them tell you that we've seen stars form. Nobody has seen such a thing. All we do see is them blow up, which is the opposite of what evolutionists need. The Bible says in Genesis chapter 1: “Let them be for signs and seasons, and for days, and years... And He made the stars also.” Here God is claiming He made the stars. And it says in Psalms: “He counts the number of the stars.” Not only the number of the total, but each one has its own number. 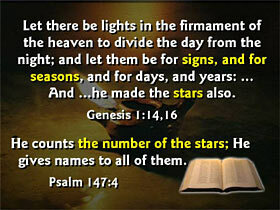 So God will say: “Oh, this is star number 42 trillion, you know, 718 billion.” He knows the number of each one. And it says: “Praise Him, ye waters that be above the heavens” in Psalm 148:4. This is the only verse that says anything like this: “...waters that be above the heavens.” Now in Genesis one (v. 6-7), it talks about water that were above the heavens. I believe that when God first made the world, it was very, very different from what we see. It was mostly land instead of the huge oceans that we now have. Most of that water was in the crust of the earth. We cover that in video 2. But there was earth and there was “heaven,” singular. King James is the only Bible I'm aware of, that gets it right in Genesis 1:1 where it says: “In the Beginning, God created the heaven and the earth.” All the rest of them say ‘heavens’, ok. That's a mistake. There was heaven, which means expanded place. There was earth, and then from here, on out. Then He divides it up into three slices; first heaven, second heaven, third heaven. The first heaven is where the birds fly. Genesis 1, verses 20-21 talk about that. Then there was water above the firmament. Now some creationists do not believe in the Canopy theory. I understand. I've read their stuff and I think they're wrong. I still believe..., and some accuse me, you know, you don't agree with us, and therefore, you know, you are not a good Creation scientist. You need to keep up on your research. I do keep up very much with the research and I disagree. It is not that I haven't read it, I have read it and I disagree, ok. But I believe there was a layer of air for Adam to breathe, a layer of water above to protect them, and then a layer of stars, then more water. The only verse I have to back it up is right here, Psalm 148:4: “Praise Him ye waters that be above the heavens.” That is present tense. Is there still water above the heavens? Psalm 104 (v. 3) says: “Who layeth the beams of his chambers in the waters: who maketh the clouds his chariot: who walketh upon the wings of the wind.” Could it be that there is another layer of water beyond all of outer space? Maybe everything that we see as this universe, that's looks to us so huge, is inside water, a crystal, and God is outside of that; the third heaven (II Corinthians, chapter 12). Could there be a third layer where God lives? Of course, God doesn't need a place to live. He just is. 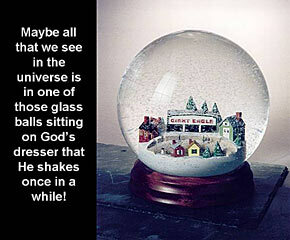 “I am.” Psalm 9 says: “The voice of the LORD is upon waters; the LORD is upon many waters.” Maybe everything that we see when we step out at night and say: “Wow, look at all these stars!” Maybe the whole thing is a little snow globe on God's dresser that He picks up and shakes once in a while. You know like: “How are you doing in there?” But Psalm 148:4: “The waters that be above the heavens.” People have often asked: “Hey, where is the last star? And once we have found it, what's on the other side?” I don't know the answers, but just a possibility is, that according to the Bible, there still may be water above the heavens. There are a lot of stars out there. 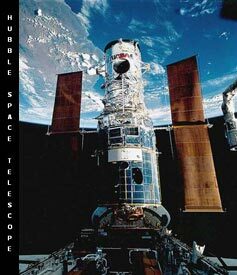 The last Hubble-based estimate was 11 trillion stars per person. That is 70 sextillion divided by six billion people. Every one of you gets eleven trillion stars. What happened was they told the Hubble telescope to focus in on a dot. See the picture of it there. They found a small dark area above the Big Dipper, about the size of a grain of sand if held at arm's length, and it was black. They didn't think there were any stars there. They decided to focus in on that spot and see what we could find. They took pictures 10 days straight, focusing in only on that dot. After 10 days, they found more stars in that dot than they could count! These were brand new stars never seen before. They called it, ‘Hubble Deep Field’. Something they had never before known about. An assumption would be that it's that way all through space. Truly the stars cannot be numbered. That's what the Bible says, that they cannot be numbered. But how do you tell the distance to the stars, and how can the earth be 6,000 years old and the stars so far away? Fair question. Scientist Stephen Hawking said: “Stars are so far away, that they appear to us to be just pinpoints of light. We cannot see their size or shape. How do we tell different types of stars apart? For the vast majority, there is only one thing we can see and that is the color of their light.” If you get the biggest telescope on earth; this is not it by the way, spotting scope; the largest telescope on earth and look at the closest star, which is Alpha Centauri, 4½ light years away, all you are going to see is a dot. If I focus this in on the Sun, it'll get bigger and bigger. And you can actually see flames leaping off, and you can see spicules, and you can see color changes. And you can actually see features of the sun. When you look at a star, you never get to see that. Nobody has ever seen a star as far as see the features of it. You get the biggest telescope on Earth. It is going to be nothing, but a dot on your scope. All you can tell, that's a red one, that's a yellow one, that's a blue one. That's all you can see. So anything we do we have to take on assumptions just from the color. But how do you tell the distance to the star? Well, I taught high school trig for years. 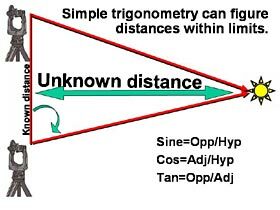 And if you guys have had trig then you will know how it works. If you have two observation points, you can calculate the third distance. It's solving a triangle. Trigonometry deals with triangles, sine, cosine, and tangent. If you know one distance and two angles or two distances and one angle, you can calculate the rest of the triangle using sine, cosine, and tangent. Here's the problem. The earth is only 8,000 miles (13,000 km) in diameter, which compared to the star distance is zero. It's nothing. So if I'm looking at a star, and somebody over in China is looking at a star, we are 8,000 miles (13,000 km) away from each other, straight line through the earth. That would be nothing. 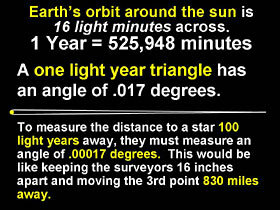 What they have done to enlarge the distance to look at a star, instead of being on opposite sides of the earth. The earth is also going around the sun in this great big huge circle. We're going 66,000 miles (100,000 km) an hour, and it takes us a year to go around, a great big racetrack. Well, the distance from the Earth to the Sun is about 93 million miles (150 million km) average, that's a lot. But at the speed of light, it's not much. At the speed of light, it's 8 minutes away. It takes the sunlight 8 minutes to get to the Earth. 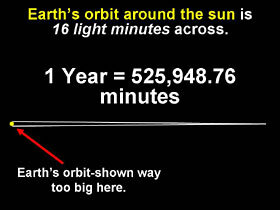 So if we're 8 light minutes from the sun, the diameter of our orbit going around is 16 light minutes. So what we're going to do is we're going to look at a star in January, and then we're going to look at it in June, and we have now gone half way around this monster circle. And we're going to get two observation points to try to enlarge the base of our triangle, and it sounds huge. Man, that's 186 million miles (300 million km). Well, it's still not much. A year has 525,000 minutes, in a year. If this picture here showing the little yellow dot was the scale. If that little dot represented Earth's orbit, not the Earth's diameter, the orbit of the Earth. It's way too big for the picture. What we're going to do is trying to show you the math involved. If I had two surveyors setting up with their transits and their telescopes, and they are 16 inches (40 cm) away from each other, and they're both looking at a dot 525,000 inches (1.3 million cm) away, which is 8⅓ miles (13 km). Would you agree, that would make a rather skinny triangle? Let's go out on the parking lot and draw a triangle with Point A and Point B, 16 inches (40 cm) apart, and Point C, 8⅓ miles (413 km) away. That would make a real skinny triangle. That is exactly the triangle you get when two people on opposite sides of the Earth's orbit try to measure one light year; one. And I'm not sure if you can tell exactly where you were 6 months ago. I think that would be a little stretch of the imagination to say: “Oh yeah, 6 months ago in January we were... where were we...”. I'll give them that, I won't even argue that. I would just bring that up, you know, for appeal, your honor, in case we need to. You can't know exactly where you were six months ago, but the angle you get with that is 0.017 degrees. Now just imagine this. I want you to get two guys to set up their surveying transits. 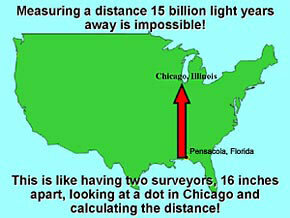 They are 16 inches (40 cm) apart, and I'm going to put a dot 8⅓ miles (413 km) away, but they don't know how far away it is. They are both focusing in on the dot, and they see this dot out there. 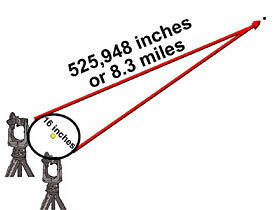 Here's the only information they have; the measurement between themselves, 16 inches, and the angle out of parallel. I say: “Guys, I want you to calculate how far away that dot is based on that little angle change you get.” I think that would be difficult to measure, one light year. You'd certainly, there would be some guesswork involved, ok. Now if you want to measure 100 light years, you got a much worse problem. Now you got to move your dot 830 miles (1,300 km) away. If we had two guys on the roof of this building here in Pensacola, Florida, 16 inches apart and they're both focusing in on a dot in Chicago which is 830 miles (1,300 km) away, but they don't know how far away it is. They are going to tell me how far away it is, based only on the angle of their telescope out of parallel. I would say that's impossible, impossible. To measure 15 billion, no question, that's impossible. I don't think you can measure 100 light years, not with real numbers, not with real measurements. This textbook says they can measure, Parallax trigonometry can measure up to a hundred light years. Ok, I doubt, but I'll give them 100. I'll even give them 1,000, if they'll quit crying, The fact is you can't measure a billion, simple fact. So here are some things to consider about starlight. They said in 2004 that with the new SIM technology, Space Interferometry Mission, they hope to improve the accuracy of measuring the distance to the stars. They say: “This accuracy will enable SIM to determine stellar distances to 10% accuracy out to a distance of 482,000 million, million miles.” That's 82,000 light years. And then it says: “This is an improvement of several hundred times over what is possible today.” Well, now wait a minute, if they are going to improve it several hundred times, and it ends up being 82,000. 82,000 divided by several hundred turns out to be several hundred. It looks like they are admitting they can only measure several hundred light years. Which, I would agree. I mean, I would say that is even a stretch, but I'll give them several hundred. The point is, they can't measure billions, that is the point. So when you students in school get taught that that star is 14.629, you know, billion light years away, say: “I don't believe you at all.” It might be, but you can't prove that. They are making up a story. With SIM technology, they hope to finally be able to get out to where they can measure most of the way across our galaxy, and we're in it. We can't even measure across our own galaxy, let alone these distances to other galaxies. So I think we should look at the stars and say: “Wow, what a mighty God we serve,” instead of going out there and saying: “We know how far away that is. We know it evolved.” I mean, it's that egotistical attitude that some of these atheists get that makes you want to slap them in the face. Why don't you serve God? Look at what He made, you know. First of all, one, we can't measure these great distances. It just cannot be done. Nobody knows what light is. We call it a wave or a photon or a particle. We know what it does. We use it all the time. But actually, give me a jar of it and paint it red. Nobody knows the substance of light. What is light? And we sure don't know that it always travels at the same speed all through time or space. 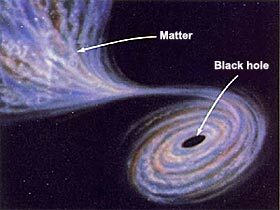 The entire theory behind the black hole is that light can be attracted by gravity. Well, if light can be attracted by gravity, then you cannot say that the speed of light is a constant, ok. At Harvard University back in1999, they slowed light down to 38 miles (60 km) an hour. The next year, they slowed it down to 1 mile an hour. And the next year brought it down to a dead stop. 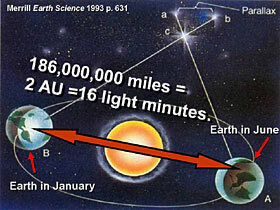 Light goes, you know, pretty quick, at 186,000 miles (300,000 km) per second. They slowed it down. It was done at Harvard. It was done at the Smithsonian. It was done at Cambridge University. It involved a repeatable, demonstrable experiment. Now that is science. If you do an experiment and get a result, then somebody else follows your data, does the same experiment, and gets the same result, that's science. They slowed light down. This article came out on Fox News Channel they said: “We have succeeded in holding a light pulse still.” They brought the speed of light to zero. They brought it to a dead stop. Meanwhile, back in 2,000 at Princeton University, they speeded light up to 300 times the speed of light. So when somebody says: “That star is 10 billion light years away, (which I doubt they can measure), therefore we can prove the universe is 10 billion years old.” They have several problems in their logic right away, that they probably don't see. That is why we do these seminars, so we can help people understand. 300 times the speed of light. Incredible! Astronomer Barry Setterfield, an Australian government astronomer said: “During the last 300 years, 164 measurements of the speed of light have been published using 16 different measurement techniques. 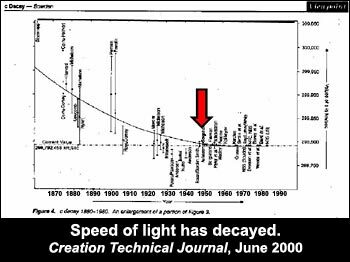 The speed of light has apparently decreased so rapidly experimental error cannot explain it.” This is a chart showing the decline in the speed of light from the published numbers in the last 150 years. You notice the decline in the chart. The speed of light is getting slower until about 1960. For the last 40 years, anybody that's measured the speed of light gets the same number; 186,282.4, I think, miles (300 km) per second. Well, it could be that it leveled off in 1960 for 2 or 3 possible reasons. Our way of measuring is getting better, instruments are getting better; we're smarter. Everybody in the past was dumb. We're smart. We got it right. Could be, that's what they'll tell you. Second option though is we're at the tail end of a logarithmic curve, and you're much less likely to see any decline. As you get further out on the logarithmic curve, it pretty much levels out. But a third reason is; 1956 is when they invented the atomic clock, and they started using that as their clock to measure the speed of light. 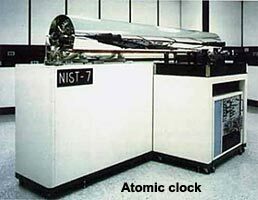 Now, wait, wait, wait, the atomic clock is based on the wave length of a Cesium 133 atom. So the clock is based on the speed of light. Now, if you have a clock based on the speed of light, and you're measuring the speed of light with it, if the speed of light changes, you're never going to catch it with that clock. It's like watching two twins grow next to each other. Wow, neither one's growing. Well, duh! You've got a ‘rubber ruler’ problem here. “We have shown how a time varying speed of light could provide a resolution to the well known cosmological puzzles.” “One of the mysteries that a decaying speed of light seems to be able to explain is why opposite extremes of the cosmos that are too far apart to have ever been in contact with the other, appear to obey the same rules of physics and are even about the same temperatures. It would only be possible for light to cross from one side to the other, if it traveled much faster than today moments after the universe was created.” Is the speed of light really a constant? There are articles here in Reuter's News Service: “The speed of light may not be a constant.” I have dozens of articles like these in the last 15 years. And we'll give much more detail in the CSE College Classes about the speed of light. So don't let somebody tell you that the speed of light is a constant. We don't know that. 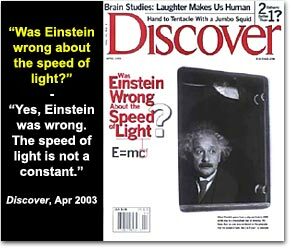 A big article came out in Discover magazine, “Was Einstein wrong about the speed of light?” back in 2000, said: “Yes, Einstein was wrong. The speed of light is not a constant.” There's the book by the Italian scientist, I assuming he is Italian [Portuguese! ], he says look: “The speed of light is not a constant.” And there have been many articles published about this. You can read them for yourself. I flash through them quickly and you can get the details yourself. So, the third thing to consider is that the creation was finished when God made it. Not only can we not measure those distances, not only is the speed of life not necessarily a constant, the creation was done. See, Jesus made wine out of grapes that never existed. It missed all that time. Instead of going from the water in the ground through the plant into the grape, squeeze it and making the wine, Jesus turned the water straight to wine. What happened with all the intermediate steps? God can bypass all that, he doesn't need any of that, ok. I ask people the question: “How old was Adam on Day Six?” Anybody know? “How old was Adam on Day Six?” - “Zero.” Did he look zero? No, he may have looked 52, or 53 years old. He was in perfect top physical condition. God didn't make two babies, and put them in the garden of Eden, and hand them a package of seeds, and say: “Here, plant these, quick. You're gonna need supper.” He has to be a full-grown man, a full-grown woman, full-grown garden. They have to have supper like tonight, you know. There had better be something hanging on the tree ready to eat. Even if you plant a tree, it's going to take 4 or 5 years to get fruit off it. 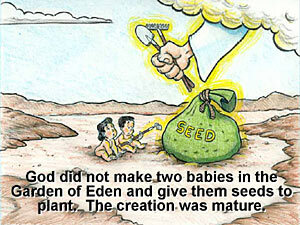 So the creation had to be mature. A fourth thing to consider about the speed of light question. A light year is a distance not a time. It's a distance. And since the speed of light is not proven to be consistent, why would star distance have anything to do with the age of the universe? Now, I am not saying and have never said: “All of the stars are inside of a 6,000 mile radius of the earth.” That's not what I say, and I don't know any creationist that teaches that. So when they say that, they're setting up a straw man and knocking it down. They're lying basically. The stars probably are billions of light years away. They probably are. We just can't measure them, that's all. I like this article in Discovery that said: “How do scientists measure the ages of stars?” They said: “Well, we can also find absolute ages by comparing a star's color and brightness with those in stellar evolution models.” What? We can tell how old it is by how old we think it is. That's exactly what they're saying, right there. That's dumb, ok. Now I think everybody is asking the totally wrong question. They are saying: “How did the light get from the star to the Earth?” They're asking the wrong question. 17 times in the Bible, it says that God “stretched out the heavens.” (Isaiah 40:22) Well, if He stretched out the heavens, you're asking the wrong question. It's not how did the light get from the star to here? But how did the star get from here to there. That's the question we need to be asking. The Bible says pretty clearly God made the Earth first. And then He made the stars also. Suppose that He made the Earth and then stretched out the stars from here. Adam would see the stars on day six and day seven and day eight. As the star is being stretched out into place, it's going to leave behind a trail of light. So the stars could be billions of light years away today and still have been created in the six days, 6,000 years ago. Dr. Russell Humphreys has a book, which I read, and I just have to say I didn't understand it, all of it. He's really, really smart, but it's a good one, on Starlight and Time if you want to get more on that. I don't know that I agree with his premise. I think he starts with the assumption that the speed of light is a constant. Now how do we explain that? And they get into this warped space and bent space stuff. I think it's much simpler. The speed of light is not a constant. And God made things, and stretched them out into place. So, if that stretching took place, maybe that explains why we have a ‘red shift’. And we'll cover the redshift question in just a minute after the break. Copyright © 2005. Made available on the Internet by Michel Snoeck, A.D. 2013.